The Diocese of Würzburg (in modern-day Germany) was created in 743. In 1168, the Prince-Bishopric of Würzburg, known as Erbipolense in Italian and Latin, was established as an ecclesiastical principality of the Holy Roman Empire and was a successor to the ancient Duchy of Franconia. The Prince-Bishops of Würzburg were frequently elected to other ecclesisatical principalities, as was common practice in Germany. In 1803, the Prince-Bishopric was secularized due to provisions of the 1801 Treaty of Lunéville and its temporal power absorbed into the Electorate of Bavaria. In 1805 as a consequence of the Peace of Pressburg, the territory became the Grand Duchy of Würzburg under Grand Duke Ferdinand, former Elector of Salzburg. This was in compensation for the annexation of Salzburg by the Austrian Empire. Previously he was Grand Duke of Tuscany. In 1801, that territory became the Kingdom of Etruria, and he was compensated with the Electorate of Salzburg. In 1814, the state was once again annexed into Bavaria. Ferdinand again became Grand Duke of Tuscany after the Napoleonic Wars. 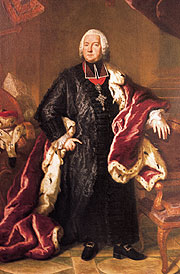 In 1821, the Catholic Church established a new diocese in Würzburg without temporal power. The temporal authority of the Prince-Bishopric was ceded to the Patriarchate of Saint Stephen under the Holy Roman Empire, and the style of titular Prince-Archbishop and Elector of Würzburg is held by the Patriarch immediately upon election. The Residenz Würzburger is the historic official residence and is now maintained by the German state. 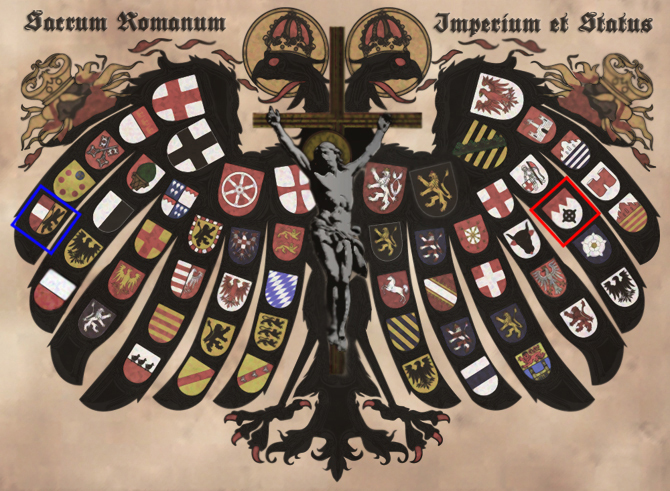 The House of Coberly v. Reichenberg in the Holy Roman Empire, descended from the ancient Italian and British nobility, is a successor to Würzburg as the ecclesiastical Regent. are the arms of Salzburg and Würzburg. This is the official website for HMSH Prince Dom Daniel Coberly v. Reichenberg. The Legal Disclaimer for the Serene House of Reichenberg in the Holy Roman Empire. The Serene House of Reichenberg in the Holy Roman Empire, the House of Coberly v. Reichenberg comprise a sovereign dynastic house and are further part of a non-profit religious corporation incorporated within the United States of America. This website in its entirety is the Intellectual Property of the Serene House of Reichenberg. The information, text, photos, documents, and media in any form whatsoever contained in this website is International and United States Copyright and Trademark Protected. No part of this website, may be copied, shared, or transferred without specific, written permission of the Royal House of Westphalia. The unauthorized use, disclosure, copying, or alteration of this website is Unlawful and Violation is Subject to possible Civil and Criminal Penalties. The Serene House of Reichenberg, all dbas, and its parent corporation, and its members are not and will not be liable for any direct, special, indirect, or consequential damages arising from alteration of the contents of this website by a third party or as a result of any malicious code transferred to a third party by virtue of visiting this website. Crown, International, and United States Copyright Held © 2008-2017, All Rights Reserved.